During the summer I like to break some of the more formal rules in menswear and just play with different styles a little bit more. Perhaps that's because of how the sun (still waiting this summer though) affects us Finns who only get it for a few months in a year, who knows, but when the snow melts and the birds start singing it is time to dig out your loafers and linen ties. 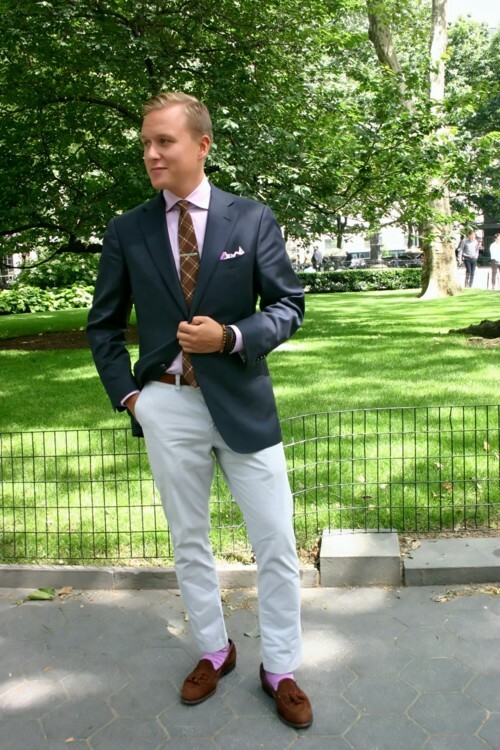 In this text I'll go through some things that I personally feel are essential to summer looks, and that can liven up an otherwise normal work look without making you look like an out of control dandy at work. So, first up. Linen, lightweight cotton and linen-cotton blends are made for spring and summer time and are pretty much my favorites as odd-jackets or as suit material during the warmer months. Colors can be anything from white (harder to pull off, off-white easier), light grey, cream, mid-blue to navy. Avoid darker hues of grey, often seen in (formal) suits. If you go with an odd-jacket and chinos, for example, remember to make sure there is enough contrast between the garments. 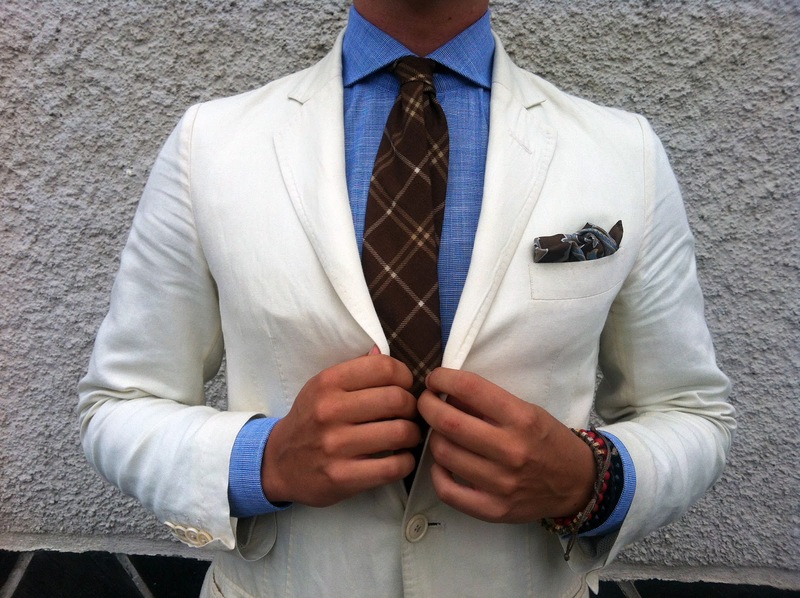 Too often people wear combinations without any contrast between the main parts, which tends not to work. As for shoes nothing beats loafers, worn with socks or without. 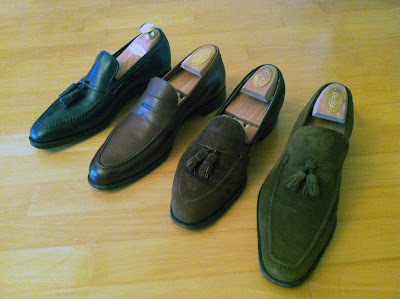 They are the superior summer shoe that come in many shapes and forms, tassel loafer being my favorite. Loafers also come in sleeker and more modern forms as well as in more classic ones. See the picture below, and you can see different characters of four quite different styles: Italian, American, English and French. In addition, these pairs obviously also differ in material, but the quintessential style differencies in the shape are easy to spot. At last, the style of the shoe should follow your build and other cloths on you to create a consistent and harmonic look. Other good and very summery options would be suede chukka boots (bright colors may work as well, and navy is just cool), a pair of casual derbys or a maybe just a more light colored pair of oxfords. However, with a suit all normal shoes still go as well as before, and in some offices the more playful option might not be options at all. Like always, you must take your culture and surroundings into account. Then the accessories. Even though sometimes not needed at all, they offer you countless ways to alter the way you look, even more so during the summer. Apart from the very obvious fall colors pretty much everything works. Pastel colors are perhaps the most chic option, but I wouldn't draw too many limits for this. Go with nice and slightly rougher textures found especially in linen, but for example cotton or lightweight (cashmere) wool ties also offer a fresh alternative from the silk and other heavier ties you wore the whole winter. Linen pocket squares with contrast borders (say, a fresh sky blue border on a white square) are something that work very well also during the summer. Oh, and for a young man, some leather and bead bracelets are not a bad idea to add a touch of color and playfulness. Then last, but certainly not the least, the shirt. If you haven't already, then the spring/summer is a good moment to burn all your old fashion shirts with boxy and short collars without any roll. If you never had any Hugo Bosses lying around then all the better. Summer is all about softness, natural lines and amazing textures. My personal favorites are soft and beautifully rolling Italian collars that compliment your tie and more relaxed shoulder the unstructured and less padded summer jackets (should) have. 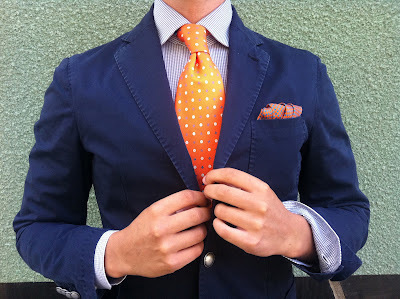 Possible colors for your shirts is not too different from other seasons, but I have seen many succesful efforts where men have used the shirt as the party piece of their combination playing other parts down and using a more flashy high-contrast gingham check shirt or the like. Too much never works however, so make sure your other parts are simple and perhaps leave the tie out. In the end, summer is when we can loosen up a little bit. Wearing something a tad more relaxed and fitting to the weather helps you tune in and enjoy the weather. The first thing I miss from the Southern United States for sure, is that I was able to do this every day and not just for a few months during the whole year. 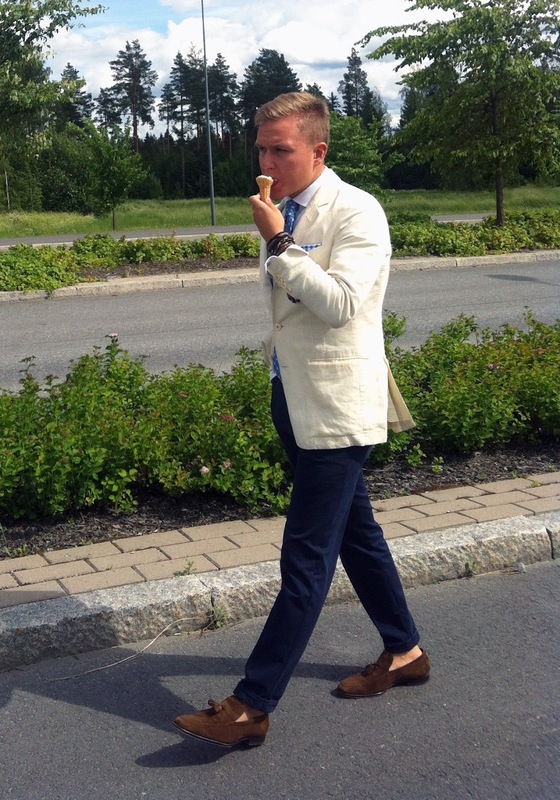 To me, jumping into a pair of loafers sockless is simply the feeling that makes the summer.